Description: Incomplete Early-Medieval Frankish gilded silver radiate-headed brooch. Worn semi-circular head-plate with five integrally cast collared knobs, the plate with a crescent-shaped panel of counter-relief decoration comprising four large spirals within a beaded border. The spirals are arranged so that the two on the left are both clockwise and form a reversed S; they are then linked by a ridge to the spiral on the far right, which turns anti-clockwise. The near-right spiral is detached and turns anti-clockwise. The short, flattened bow has a cross-shaped moulding with worn pairs of engraved lines on the horizontal arms, and traces of a possible line of dots on the vertical arms (comprising a single dot at both ends but otherwise worn away). The four panels of the field each contain a worn raised area, also with traces of bordering lines of punched dots. The bow is broken along the lower edge where the foot is missing. There is the stump of a single pin bar lug on the reverse of the head-plate, broken across the perforation for the missing pin. Gilding survives in the detail on the headplate, on the transverse lines of the knops, and in the engraved detail of the bow; it was probably originally entirely gilded. The break is very worn. Dimensions: Surviving length 32mm. Width of headplate 34.5mm, of bow 11.5mm. 2.5mm thick. Weighs 6.86g. Discussion: Radiate-headed brooches are a Frankish type and are not common in England. The few similar examples of five-knobbed headplates on the PAS database include two in copper alloy, from Costessey in Norfolk (NMS-4069A0) and East Kent (KENT-F97E52). The latter has similar spiral decoration with a reversed-S to the left and an S to the right; this decoration is also found on a brooch from Mill Hill, Deal (grave 92, brooch 92g; Parfitt and Brugmann 1995, 43) and three from Marchélepot in France, now in the collection of the Ashmolean Museum (MacGregor 1997, no.65.6 and pair no. 65.12). The British Museum has two, one from Herpes in France (1905,0520.211) and another from Howletts in Kent (1918,0711.2). 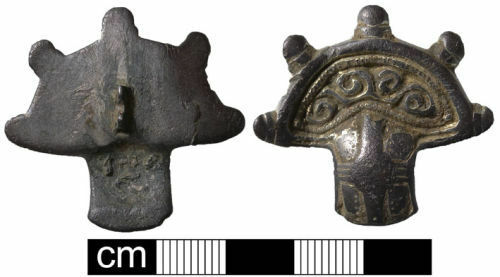 Date: This type of radiate-headed brooch is dated the first half of the sixth century AD by Werner (1961), and to Kentish Phase III (530 to 570AD) by Parfitt and Brugmann (1995, 43, 105 and Table 11).